Elective or emergency reconstruction of abdominal wall defects (AWD) is often difficult. Various techniques have been proposed for reconstructing AWD, including the use of synthetic implants. Porcine acellular dermal collagen (PermacolTM) is a biologic implant (PADCI) derived from porcine dermis. 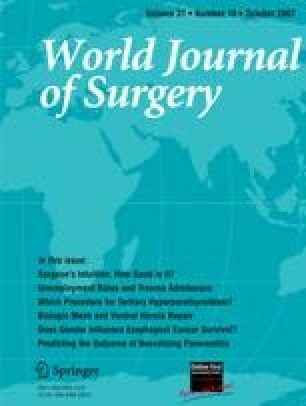 We report our experience with the use of PADCI in the management of large AWD in both emergency and elective surgery. Twenty consecutive patients with chronic AWD (CAWD) arising from large incisional hernia or acute AWD (AAWD) arising from visceral edema or tumor resection were studied prospectively. After musculofascial mobilization, the AWD was closed using sheets (10 × 15 cm) of PADCI as an “underlay” interposition graft. Patients were followed up to a median of 18 months postoperatively. All 20 defects were closed without tension using PADCI. Eight and 12 patients had reconstruction for large AAWD and CAWD, respectively. The mean size of the defects was 180 cm2 (range = 96–850 cm2). The median number of PADCI used to repair the defects was one sheet (range = 1–7). Twelve patients (60%) had an uneventful recovery and were discharged within seven days. One patient (5%) died from multiple-organ failure. Seven patients (35%) developed a complication (two seromas, two minor wound infections, one wound hematoma, one skin edge necrosis, one superficial wound dehiscence, and wound sinus). Overall there were three recurrences (15%). PADCI has the potential for reconstruction of large acute and chronic abdominal wall defects. Medium-term recurrence rate is comparable to synthetic mesh repairs.